Seasons Greetings! We pray as the holiday season starts that you and your families are blessed with health and that you will be able to be together. At the end of October, we had a family come and stay with us for 3 days. The Willis family has the technology to locate water electronically. While they were here, Bob took them to 5 different areas where he plans on drilling. From all indication, they found sources at each location. Time will tell when he drills if this is accurate. Please pray that he will be successful in drilling. November has been busy for everyone here at Servants Hearts Ministries. Michael and Kelly and their family went to the states to visit . They have a new grand-daughter, Emily, they had a great time. Vinicio and Jose stayed busy preparing for the next teams to come. They did prep work for building houses and then built 2 houses in El Rodeo. Kim Rogers found out about our ministry online and contacted us and wanted to bring her son and a friend . 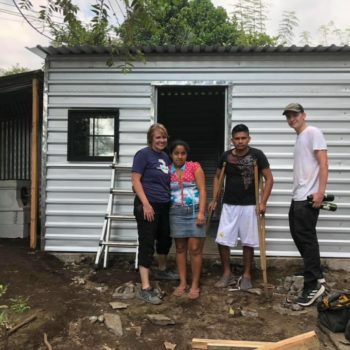 Kim, Hagen, and Jon built a house with Vinicio, Michael, and Jose. We are so thankful for these guys and the hard work they do for the Kingdom. Bob has been working on getting the drilling rig ready to use in January. I’ve been checking on families and the day care in Santa Maria. We are looking forward to our time in the states next month. We will be visiting family and also have some speaking engagements. 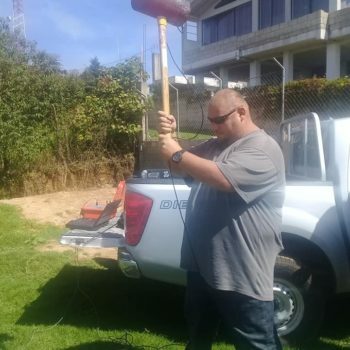 Prayer Requests: safety for our teams as they minister, overall function of the drilling rig, strength and health for Bob and the guys, we praise God for the expansion of the ministry which enables us to touch more lives.